Fuzzball & Scuzzball - ROUND 2, Part 1! Comic 253 - ROUND 2, Part 1! Round 2 is here, picking up right where Jeffrey Johnson's Round 1 left off. Today's installment is brought to us by my friend Josh Burnett, a talented writer and artist who is probably best known for his RPG blog Bernie the Flumph. Josh has also done plenty of great comics and illustrations, but I'll talk about those tomorrow. Josh said he was influenced by the great Tom Scioli in this one, and I think the influence is particularly apparent in that third panel. TOMORROW: Round 2 continues! 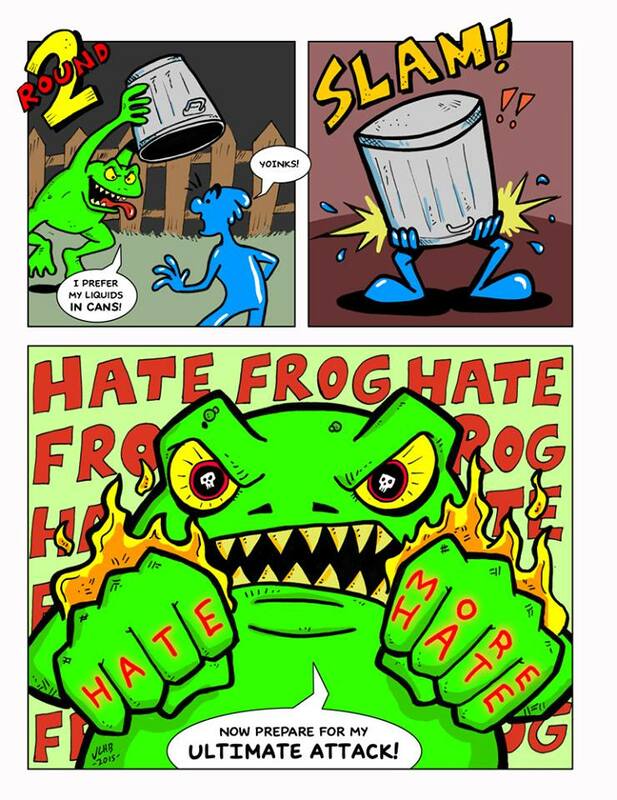 What is Hate Frog's ultimate attack? It's . . . it's pretty amazing, actually. You'll never guess what it is, so tune in and find out.